I think this is the best thing I have ever done. I have no idea how it happened. I burned a large amount of artwork, visual art, asemics last night. It was fantastic. "We rely too heavily on the body of the text"
Today's decal and asemic. Going green. For a bit. A decal this morning. No anger but fear. I stole this from Yoda. I live yellow. This is a poem from my new chapbook, THESE BURNING FIELDS from Hysterical Books. I hate sharing my poetry; I would rather share art, but I wanted to give it a good try. Yay. These are from yesterday. More asemic translations from an instructional booklet on calligraphy. I added decals which are ok. 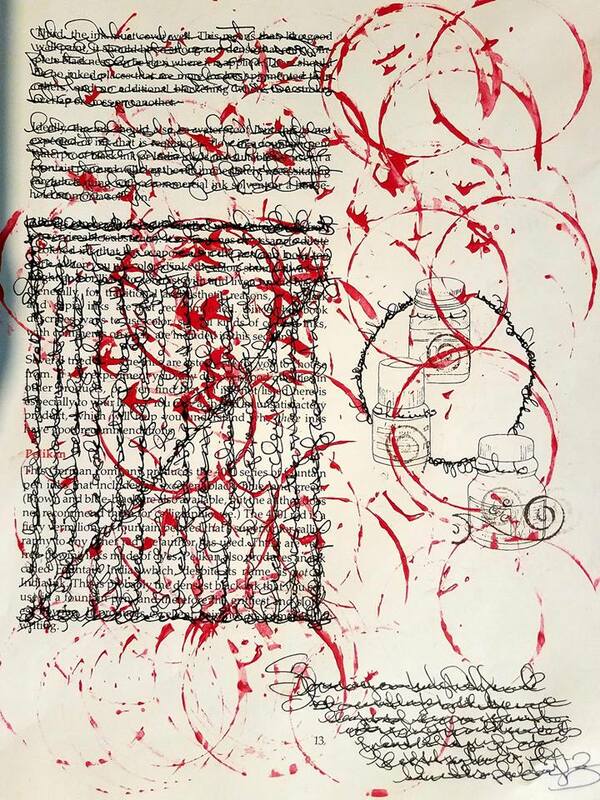 I like practicing writing and the process of asemic writing. Sometimes I feel like I could do it forever. Supposed to be grading but now I am caught up in the blog here and it is Saturday night and I am going to run up to campus and listening to zero 7 today need more caffeine this might be my last blog post ever thank you and that is the paris opera behind me which was one of the best experiences of my life so really including the uber driver, nassar. la pluie!! I haven’t done a self-portrait in water colors in a while. These are fun. A translation of the calligraphy book I bought at a used bookstore. Also, stamps and red acrylic paint. One of my favorites. Here is a “decalcomania” or pressed paint. "Mouvement Petits Jeux Floraux" borrowed from Kenneth Koch. I started translating the text of this old calligraphy (pronounces KAL i grafy) book I got. A pic of my arm and an asemic translation I am working on. The ink is surely toxic. until it is worked free. Or pierces us in the trying. Remove the pie. Remove the pie with a clamor. Remove the pie. Remove the pie with a clamor. Remove the pie, quietly and with a clamor. Remove the pie. Quietly and with a clamor. With a clamor, remove the pie. With a clamor, quietly remove the pie. With a clamor, quietly remove the pie and the fervor. Quietly, remove the fervor.